A delightfully wacky and informative guide to recreating civilization should you find yourself stranded in the past with a broken time machine! You’ll learn skills like how to test whether foods are poisonous, and how to build a steam engine. A great gift for your inquisitive and humor-loving friends. This book comes from Ryan North, the author of Dinosaur Comics (www.qwantz.com) - check it out if you like the humor here. 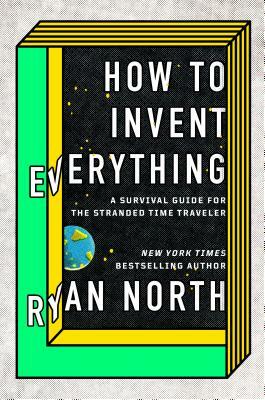 "How to Invent Everything is such a cool book. It's essential reading for anyone who needs to duplicate an industrial civilization quickly." --Randall Munroe, xkcd creator and New York Times-bestselling author of What If? What would you do if a time machine hurled you thousands of years into the past. . . and then broke? How would you survive? Could you improve on humanity's original timeline? And how hard would it be to domesticate a giant wombat? With this book as your guide, you'll survive--and thrive--in any period in Earth's history. Bestselling author and time-travel enthusiast Ryan North shows you how to invent all the modern conveniences we take for granted--from first principles. This illustrated manual contains all the science, engineering, art, philosophy, facts, and figures required for even the most clueless time traveler to build a civilization from the ground up. Deeply researched, irreverent, and significantly more fun than being eaten by a saber-toothed tiger, How to Invent Everything will make you smarter, more competent, and completely prepared to become the most important and influential person ever. You're about to make history. . . better. Ryan North is the New York Times-bestselling author of Romeo and/or Juliet and To Be or Not To Be. He's the creator of Dinosaur Comics and the Eisner Award-winning writer of Adventure Time, Jughead, and The Unbeatable Squirrel Girl for Marvel Comics, and he has a master's in computational linguistics from the University of Toronto. Ryan lives in Toronto with his wife, Jenn, and their dog, Noam Chompsky.